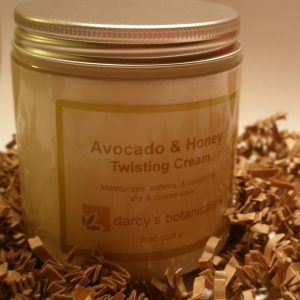 It is a thick, milky white cream and is scented with Ylang Ylang and Lemon! Use to moisturize and soften dry, coarse coils. Best used on type 3-4 hair types due to heavy concentration. organic aloe (barbadensis leaf) juice, distilled (aqua) water, persea gratissima (avocado) oil, elaeis guineensis (palm) oil, emulsifying wax nf, glycerin,hydroxyethyl cellulose, caprylic/capric triglyceride, achillea millefolium (yarrow) leaf extract, salvia of?cinalis (sage) leaf extract, (equisetum arvense) horsetail extract, utica dioica (nettle) leaf extract, lavandula angustifolia (lavender) ?ower extract, panthenol, wild?ower honey,phenoxyethanol and caprylyl glycol, canaga odorata (ylang ylang) Flower oil and citrus medica limonum (lemon) oil.